I MADE COOKIES! Can you even believe it?! Not only did I make cookies, but I decorated them and I couldn’t be more proud! AND I made a recipe using ingredients that I wasn’t sure I would love and not only did I prove myself wrong, but OMG I’m obsessed with these Pecan Sugar Cookies! I had to give them away because I could not stop eating them all day long. You guys know how much I encourage you to try new recipes that push you out of your comfort zone. I think it’s really important and helps you get out of your cooking rut. It’s the only way to learn new things and experience new flavors. Believe it or not I had never made a homemade sugar cookie in my life. I was scared, intimidated and pretty positive they wouldn’t turn out how I envisioned them in my head. Believe it or not, they turned out better! I love the addition of the crushed candied pecans in the cookie batter. It gives the cookies amazing texture and an extra layer of flavor. I’m so excited to parter with Santė Nuts this holiday season and offer you this incredibly easy cookie recipe! If you’re not a nuts in your cookie kind of person, I totally get it! Don’t worry, these nuts are amazing on their own, in salads or on your holiday cheese board! And you know how much I love a good cheese board. 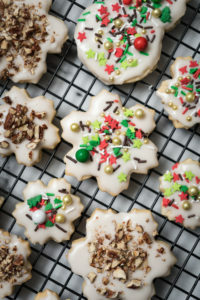 I hope these cookies inspire you to try something new, get out of your comfort zone and have fun decorating with your family and friends this season! I know I did. ???? This post is sponsored by Santė Nuts. Thank you for supporting the brands that I love. 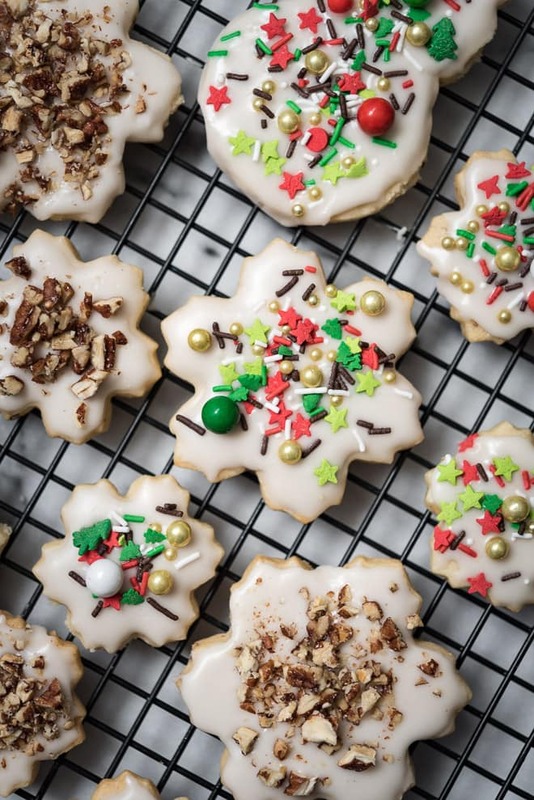 A simple sugar cookie recipe with chopped candied pecans and a light glaze that's perfect for decorating. In a large bowl using a handheld or stand mixer fitted with the paddle attachment, beat the butter until creamed and smooth - about 1 minute. Add the sugar and beat on high speed until light and fluffy, about 3 or 4 minutes. Scrape down the sides and bottom of the bowl as needed. Add the egg and vanilla, and beat on high until fully combined, about 2 minutes. Scrape down the sides and bottom of the bowl as needed. In a separate bowl whisk together the flour, baking powder, and salt. Add the chopped pecans and mix lightly. Turn the mixer down to low and add about half of the flour mixture, beating until just barely combined. Add the rest of the flour and continue mixing until just combined. If the dough still seems too soft, you can add 1 tablespoon more flour until it is a better consistency for rolling. Divide the dough into 2 equal parts. Roll each portion out onto a piece of parchment to about 1/4″ thickness. Stack the pieces (with paper) onto a baking sheet and refrigerate for at least 1 hour and up to 2 days. Chilling is mandatory. If chilling for more than a couple hours, cover the top dough piece with a single piece of parchment paper. Once chilled, preheat oven to 350 degrees. Line 2-3 large baking sheets with parchment paper. The amount of batches will depend on how large/small you cut your cookies. Remove one of the dough pieces from the refrigerator and using a cookie cutter, cut in shapes. Transfer the cut cookie dough to the prepared baking sheet. Re-roll the remaining dough and continue cutting until all is used. Bake for 9-12 minutes, until very lightly colored on top and around the edges. Rotate the baking sheet halfway through bake time. Allow to cool on baking sheet for 5 minutes, then transfer to a wire rack to cool completely before icing. Whisk the powdered sugar, vanilla, and 2 tablespoons of water in a medium bowl. It should be quite thick. If it's much too thick, add 1/2 tablespoon more water. If it's much too thin, add 2 more tablespoons of powdered sugar. If you drizzle a little of the icing with the whisk, the ribbon of icing will hold for a few seconds before melting back into the icing. That is when you know it's the right consistency and is ready to use. Decorate the cooled cookies however you'd like. Squeeze bottles make decorating easy, or simply dip the top of each cookie into the icing and decorate with your favorite toppings! *Makes about 16-18 medium sized cookies.